The holidays are nearly here. And as we make our final preparations (ok, I just started shopping this week) I am reminded of all the small appreciation gifts that I will be giving out this year: teacher gifts, something for the bus driver, the karate instructors, and of course stocking stuffers for the kids. For some of those gifts, I am going to give gift cards. 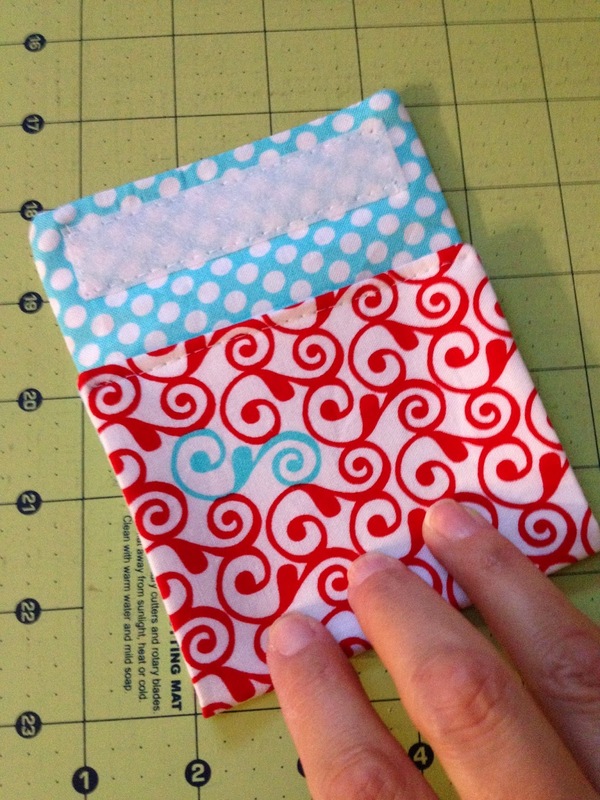 And instead of putting them in the little cardboard sleeve you get from the store, I'm going to give those gift cards in these little pouches, which, when the holiday is over and the gift card is spent, make great little change purses as well. 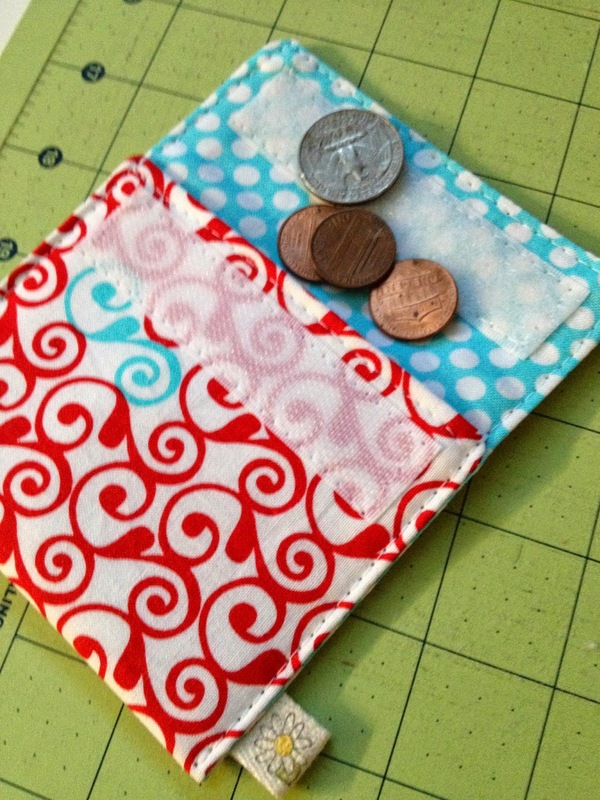 The change purses are small so you don't need a lot of fabric. 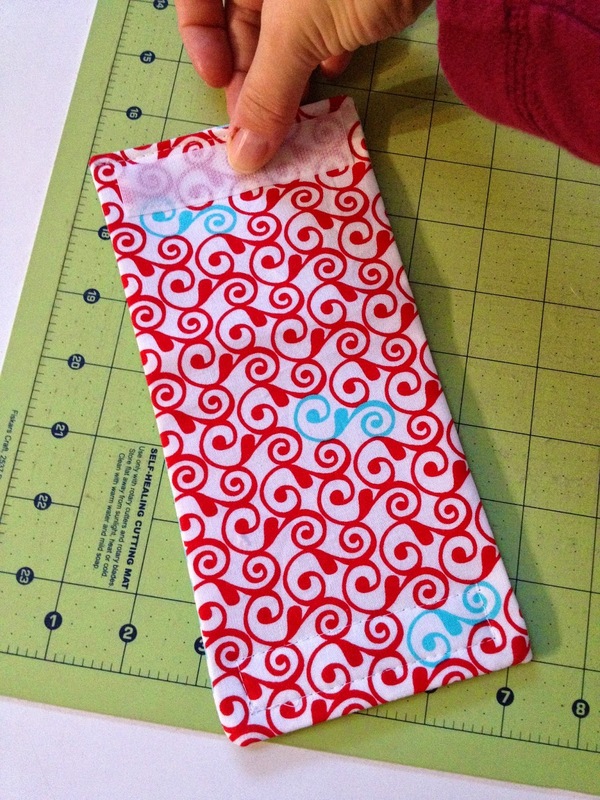 If you have some scraps in your craft room, you might not even need to buy anything new. 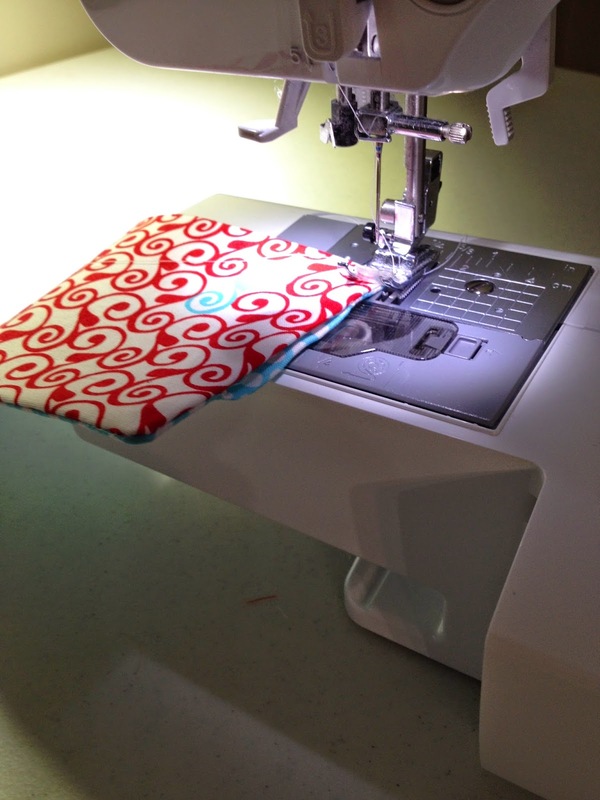 One piece of medium or heavyweight sew in interfacing. 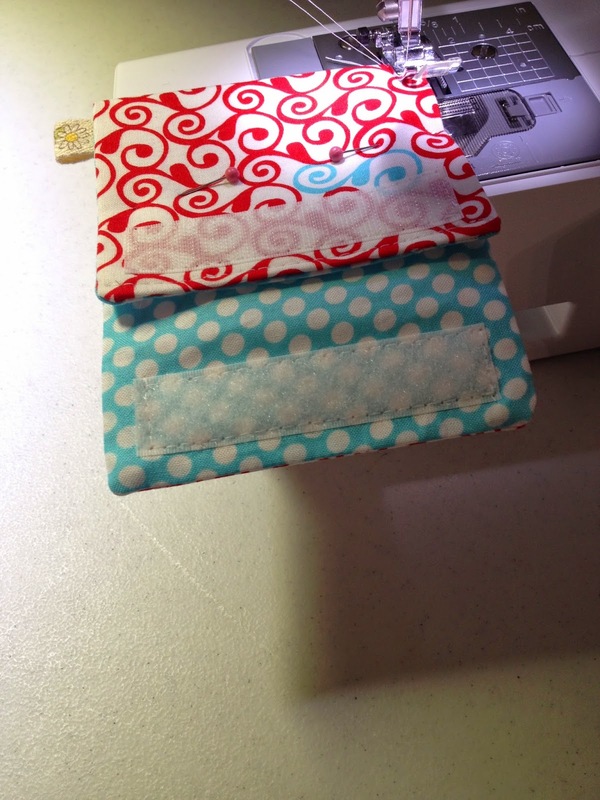 I've cut one main piece (the red swirl) one inside piece (the blue dot) and one piece of interfacing to 9.5" tall and 5" wide. This is done most easily with a rotary cutter and blade, but you could measure it out and cut with scissors. 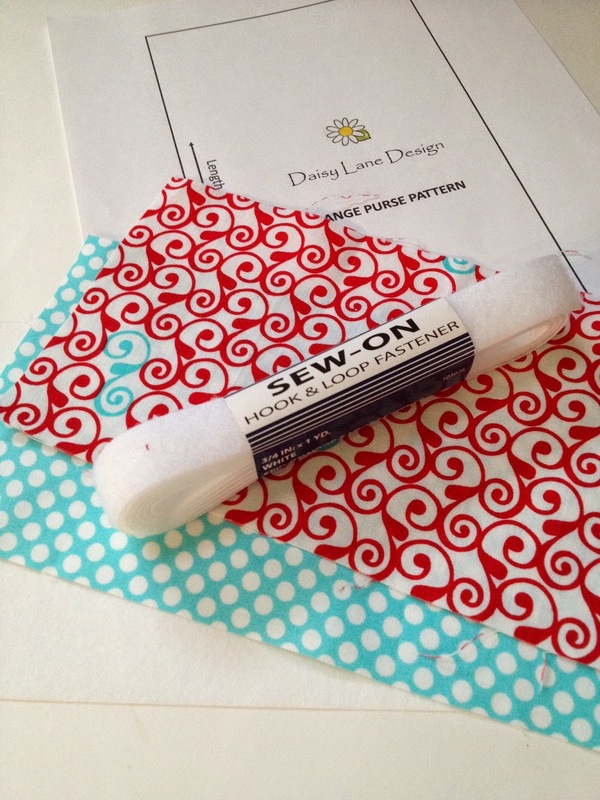 If you'd rather a pattern piece, they are available as a pdf - just let me know! 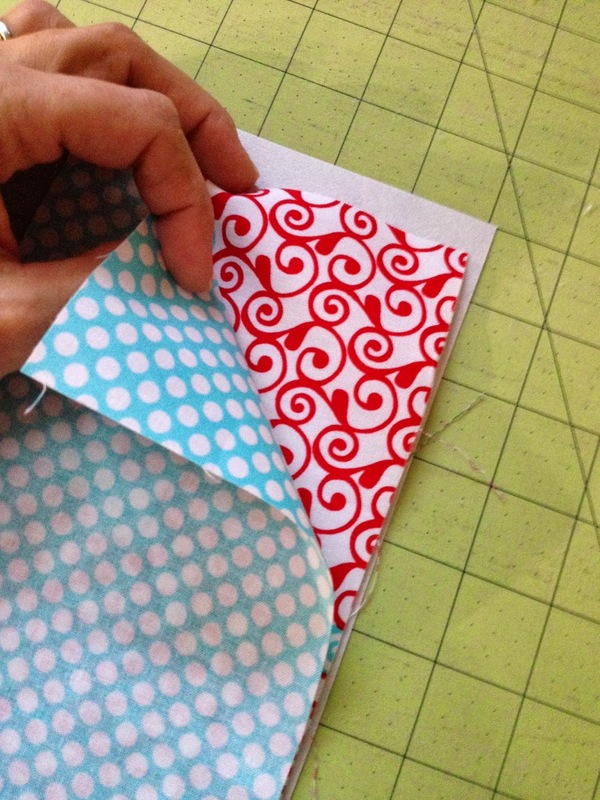 Step 2: Layer your fabrics. First, I placed the interfacing down on a hard surface. Then, I put the main fabric down on top of it with the right side of the fabric facing up. Last, I placed the inner fabric down on top of the main fabric, so that the right side is facing down. I have them all staggered in this picture so you can see all the layers, but you'll want to line all the raw edges up. See there? 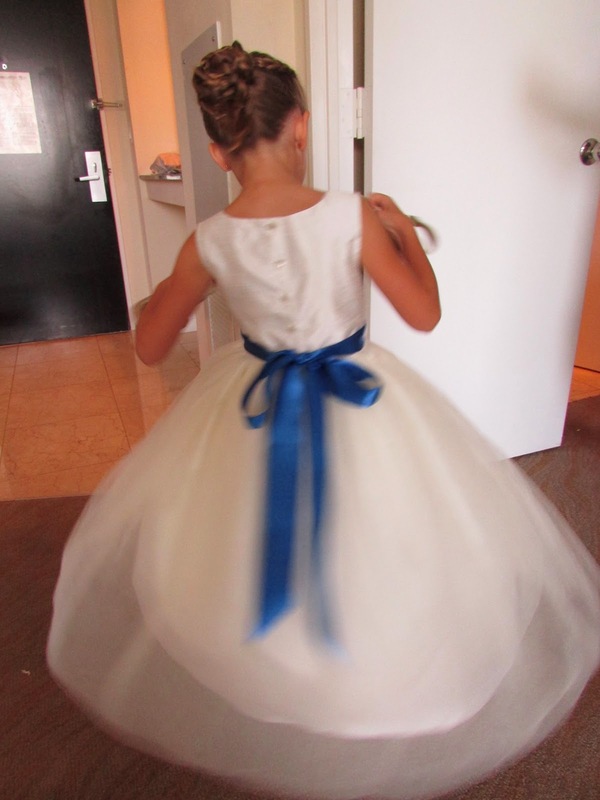 The two pretty sides of the fabrics are touching. Step 3: Getting ready to sew. OK, here are all my edges lined up. And I've pinned my layers together. I am going to want to leave a little opening when I sew. I'd like that to be along one short edge. A little trick I use is to mark my starting point with a green pin and my stopping point with a red pin. Step 4: Sew the layers together. See here? 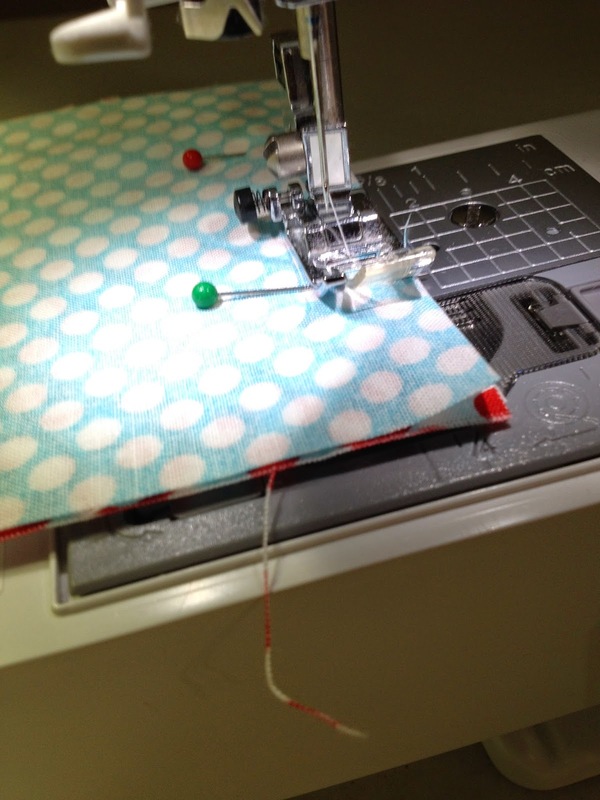 I have my little fabric sandwich in my machine, starting at that green pin. 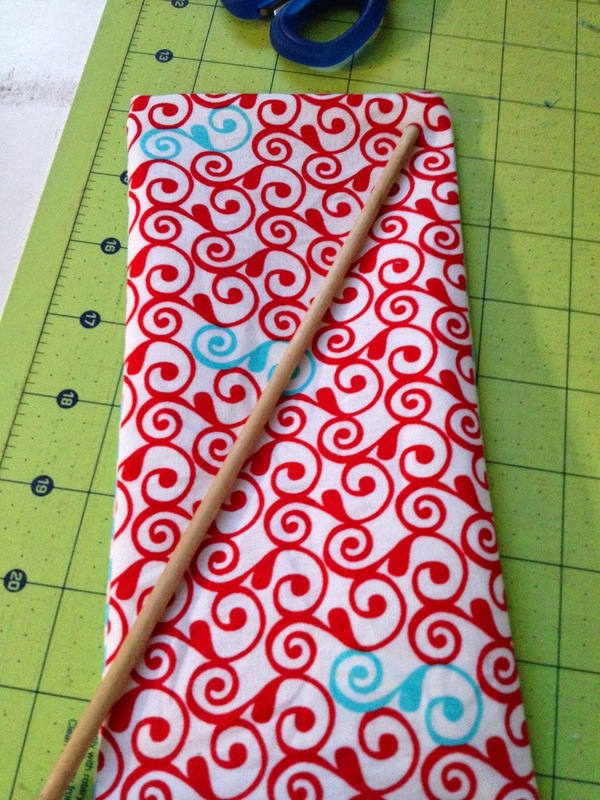 Using a 1/2" seam I am going to stitch all the way around my project in almost a complete rectangle. When I'm nearing a corner, I don't want to stitch all the way to the edge of the fabric, but turn the fabric at about 1/2" from the edge. 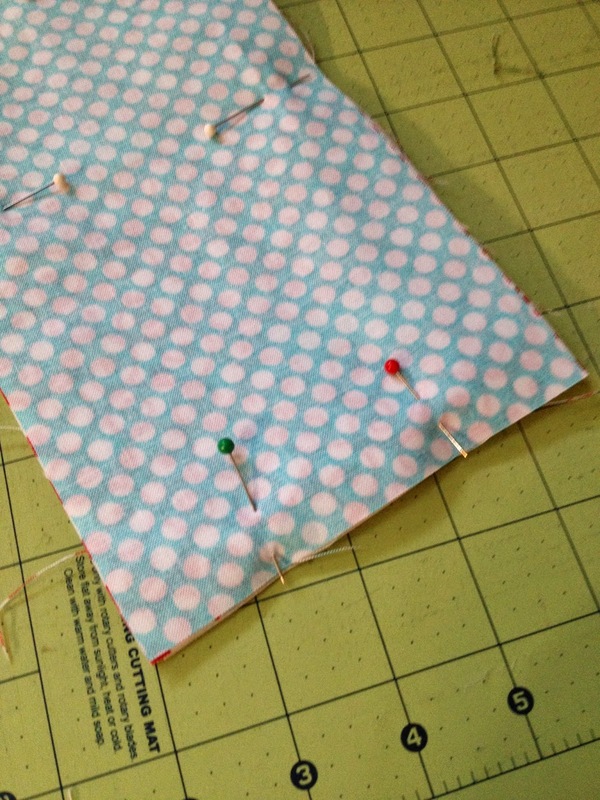 I'll stop when I reach the red pin and leave the space between those two pins open for turning. Step 5: Trim your corners. 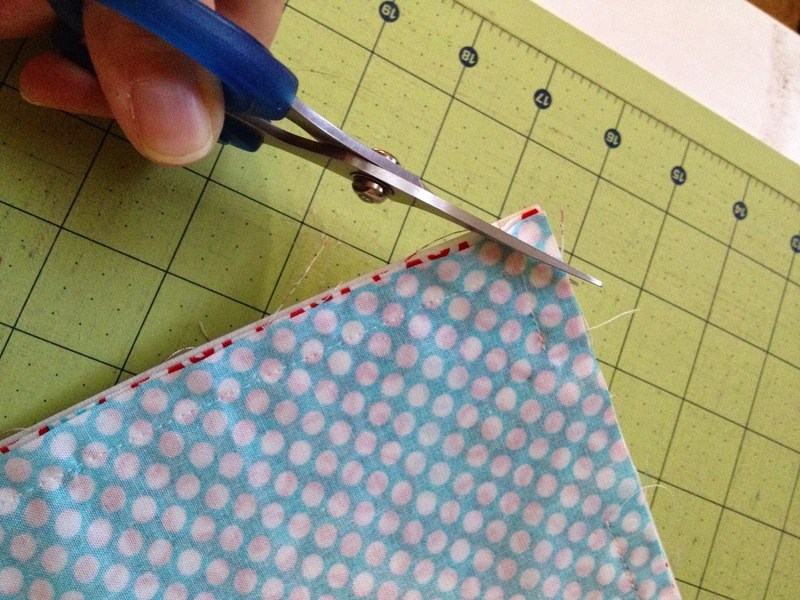 Being careful not to snip any of the stitches, I'll trim all four of the corners at a 45 degree angle. This is why it was important not to stitch all the way to the edge in the previous step. Step 6: Turn the pouch right side out. Through the little hole in the bottom, I turned the pouch to the right side. Then I'm going to use my tube turner dowel to reach inside and push each corner out so they look crisp and clean - no dog eared corners. After that, press well, taking special care to turn the raw edges of the opening in to the wrong side. Step 7: Close the opening. 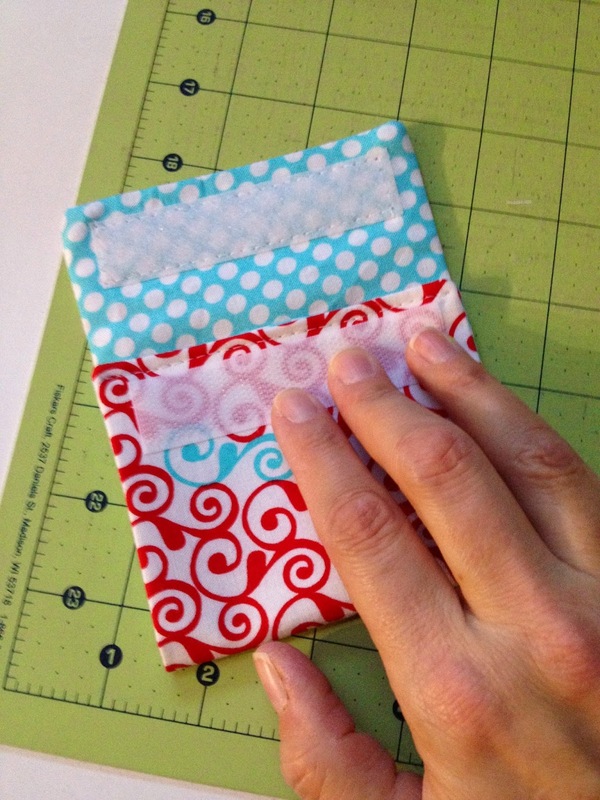 Using a longer stitch length, I'm going to sew across the entire short edge where the turning opening is. Step 8: Position and sew on the Velcro. 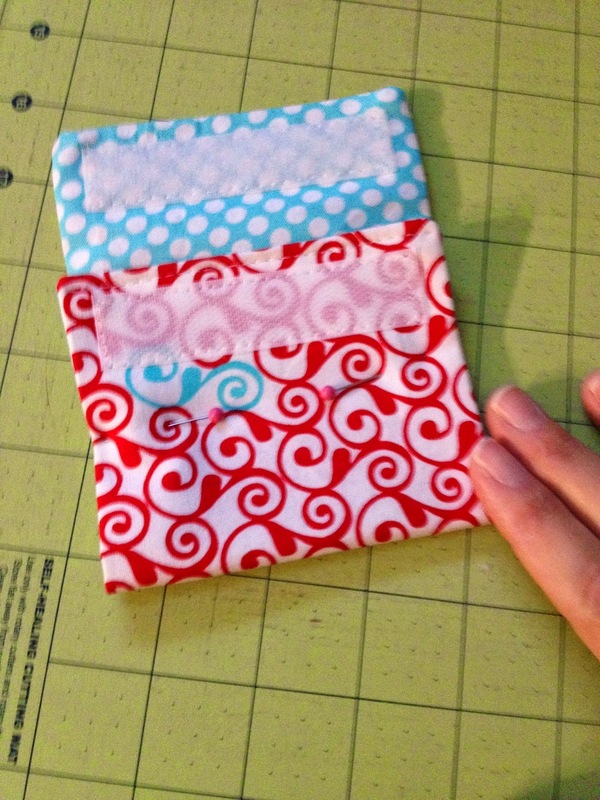 I placed the pouch down with the inner fabric facing me, and the edge I just stitched at the bottom. I placed the fuzzy half of the Velcro down from the top edge about 1/4" as seen here. Then I stitched all the way around the Velcro strip. Then I folded up the bottom short edge. The rough half of the Velcro will go here, 1/4" down from the stitch edge. Hold it in place, but then open the pouch back up again. 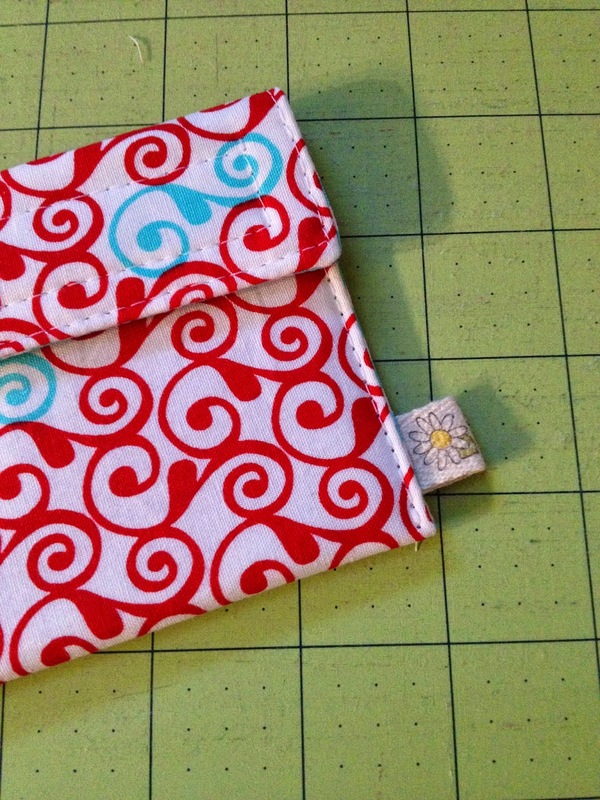 You don't want to stitch it on with the pouch folded shut or you won't be able to use it! Here's what it'll look like when you open it up. I just pinched it between my fingers and lifted the pouch up, letting it open. Then I stitched the rough Velcro in place as well, right where you see me holding it. Step 9: Finishing up the pouch. After attaching the Velcro, I laid the pouch back down with the inner side facing me. Then I folded the bottom edge up 3" and pinned it in place on the sides. Starting from the bottom left hand corner and using a longer stitch again, I stitched up one side, across the top, and down the other side of the pouch. I made sure to back tack several times at the spot where it transitions from red swirly fabric to blue dot there in the middle. That's where most of the stress will be when you're reaching in and out for coins. All done! ready for giving and gifting. If you have any questions about this tutorial, feel free to ask! If you try making one, I'd love to see it!